After weeks of applying, interviewing, hoping, praying, and negotiating, you’ve finally received the coveted offer letter. The job you’ve been fighting for all of this time is now yours. Make sure to dance around, savor this moment, and enjoy the smooth taste of victory. Then, when you are done, please mosey on over to this here blog post for a little CTJ insight. What if I told you that the job you want, may not be the job you actually want? Under a lot of fine print and red tape, you may only be privy to some of the intel regarding your new position. Which is why it’s important for you to do your due diligence when researching the company you plan to work for. Before you “sign on the dotted line”, I want to make sure that you have your eyes wide opened for this hopefully exciting new chapter in your life. 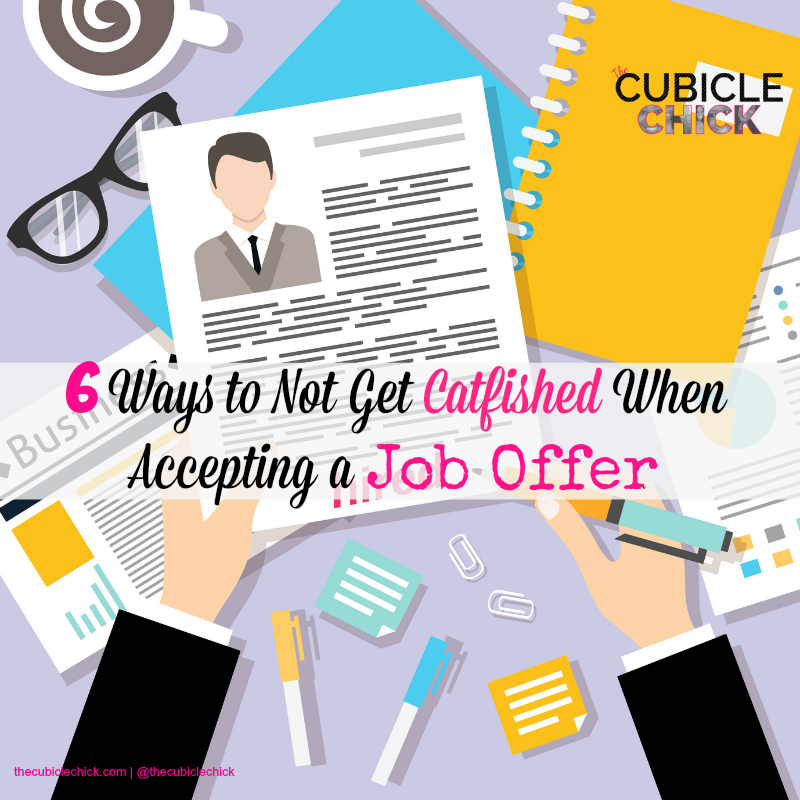 I’ve got a list of 6 ways not to get catfished when accepting a job offer, and I would read this promptly before making your next move. Based on the MTV show named after the movie Catfish, it follows people who’ve met the loves of their lives on the Internet, only to find out that they’ve been bamboozled or “catfished”– i.e. the person they thought they were communicating with wasn’t what they seemed. You can also get catfished in other instances, like a new job—because it may not be what it seems to be. When applying for a job, I always tell candidates to search the Internet and read up on their prospective employer. Just like Hiring Managers and Recruiters check social media sites of potential employees, applicants need to do the same. Check to see if there’s a high turnover, issues with the way the company does business, lawsuits, allegations, money woes, and the like. This can help you determine if the company who wants to hire you is indeed above board and is worthy of having you as one of its finest. If there are any red flags about the company, Google and other search engines is one way to find them (also, check LinkedIn for intel as well). You may have to do some legwork when it comes to really getting a feel for the company you plan to work for. Talk to other employees if you can off record to get a better perspective. Truly indulge in the company atmosphere when visiting, and try to pick up on the pros and the cons of the company culture. When signing your employee agreement and going over your offer letter, read the fine print. If there’s a signing bonus, do you have to give it back if certain requirements aren’t met? What is your true salary and is there any sort of bait and switch? Are you on any kind of probationary period? Do you have to sign a con-compete and if so, how long does it last? Reading the fine print can help you determine if there are any red flags. And it doesn’t hurt to consult an attorney who deals with contracts and agreements before you sign on the dotted line. Consult the Better Business Bureau and read up on any complaints that may have been lodged against your future employer. You can also look at Dun and Bradstreet and other sites to learn more about the stability of the company. During the interview and/or “signing” process, ask the tough questions. Inquire about turnover, issues with workplace morale, and other matters which might affect your decision to work with this employer. If you can, participate in a Shadow Day before you begin working. This will allow you to follow a colleague in your department to get a real feel of the company, its culture, and its inner workings. Doing this can really help you make the decision if the company is a good fit or not. Before accepting a job offer, you’ve got to do a little research to make sure that the company is a good fit for you do there are no surprises or let-downs. While nothing is guaranteed, doing your due diligence can help you know more about your future employer.